The beach at East Quantoxhead has an underlying geology of harder limestone and inter-bedded softer, shaly rocks, giving a stepped appearance and plenty of scope for the landscape photographer. The limestone outcrops seem to twist and turn, sometimes parallel to the beach, and sometimes at right angles, so there is always something to shoot. 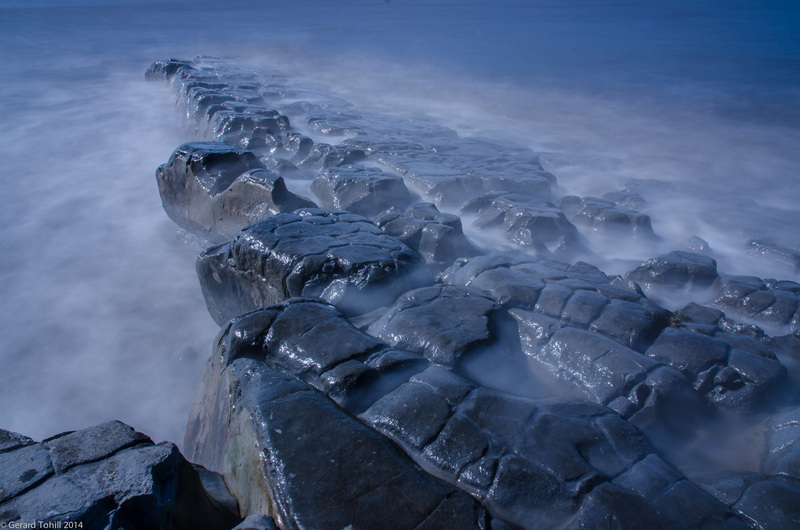 This outcrop jutted out to sea, and a rising tide gave a nice effect in a long exposure image, looking to me like the skin of a giant sea monster. I wanted the highlights on the rocks in the image but, if you don’t want them in yours, simply add a polarising filter and you should be able to cut out most of the reflections (depending upon the angle of the sun, of course). When taking long exposure images on a rising tide, be prepared to get your feet wet. It was a hot day, so I didn’t mind – I left my boots further up the beach and let the water keep me cool. Photography stuff: 18-70mm lens at 18mm, 13 seconds at f/16, 10 stop ND filter, tripod, remote release. Thank you. I’m not sure if you can on a point and shoot – at the very least you’ll need a tripod or some kind of steady support, and a neutral density filter to cut out the light. I have to use a 10 stop ND filter during the day (a 10 stop filter reduces the amount of light going into the camera by just over 1000). You also need the ability to set a long shutter speed. A quick google of your camera model and ‘long exposure’ may help. Thanks for that. I do have a tripod and probably the ability to set a slightly longer shutter speed, but not sure if I can manage the filter. You can actually practice this without a filter – what you need to do is wait until after sunset, when the light levels have dropped sufficiently to allow you to use a slow shutter speed. If you like it – then you can think about looking for a filter. Great shot, especially when viewed in larger size. Thank you – that was the effect I was attempting to get.